Industrial Heat-Tracing Control and Monitoring has never been easier than with nVent Thermal/Raychem. Innovative single and multipoint DigiTrace Control and Monitoring systems integrate seamlessly with nVent Thermal/Raychem products and can be scaled to match any size operation. Because reliable and consistent monitoring is a top priority, nVent Thermal implemented continuous programming and monitoring technology able to activate an alarm system if the slightest discrepancies are detected. DigiTrace offers units for every size operation. Products scale from the compact single-point 910 series and dual-point 920 series self-contained controllers to the advanced multi-circuit NGC-30 and multipoint NGC-40. DigiTrace products are available for use in both hazardous (Class I, Division 2) and non-hazardous locations. Additionally all DigiTrace products offer a wide range of programmable alarm settings, network-ready interfaces (Ethernet, RS-485, and RS-232), password protected access (with group policy), and 60 amp current ratings. nVent Thermal DigiTrace customers also enjoy simplified control interfacing via the DigiTrace Supervisor Software available for Windows operating systems. DigiTrace Supervisor Software can program, monitor, check, data log, generate reports, and record alarm status for individual or groups of units. This powerful software is available for DigiTrace NGC-30, NGC-40, 910, and 920 products. 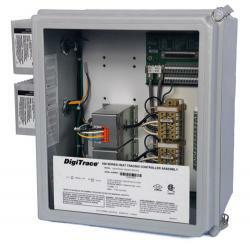 DigiTrace Remote Temperature Monitoring devices (RMM2) support the NGC-30 system by aggregating RTD inputs. DigiTrace JBS-100-ECP-A and JBS-100-ECW-A units provide precise electronic temperature control of a single heating circuit via an RTD sensor (these units are suitable for non-hazardous locations). The JBS-100-ECP-A is a pipe-mounted device that also serves as a power connection kit for Raychem Self-Regulating and Pyrotenax Mineral Insulated heating cables. The JBS-100-ECW-A is a wall mounted device that is compatible with all heating cables. Thermostats (ambient and line-sensing) and RTDs from DigiTrace are available for both hazardous and nonhazardous locations. nVent Thermal also manufactures Power Distribution Heat Trace Panels, which reduce field wiring and controller costs. DigiTrace Heat Trace Panels can be configured with group or individual circuit control and multiple breaker types (standard circuit breakers, ground-fault breakers, or ground-fault breakers with alarm). Contact AC Controls for more information on nVent Thermal/Raychem Control and Monitoring products.